No matter what type of blind you want to measure your ordering your window blinds couldn&apos;t be easier. It won&apos;t take long, just follow the simple instructions. Face - This is when you want your blind to hang outside the window recess. Recess - This is when you want your blind to fit inside the window recess. Decide what side of the blind you would like the controls. Take all your blind measurements in millimeters (mm) to the nearest mm. It couldn&apos;t be easier! When measuring blinds, always look out for things like window handles or tiles and take their position into account if necessary. This is so you can be sure of the perfect fit. All blinds wholesale window blinds can be fitted into the face of your window frame or wall, or into the top of the lintel. This gives you complete control over the positioning of your blind. Measure the height or Drop by taking the measurement from the top of the recess to the window sill in 3 places as shown. Note down the shortest measurement exact to the millimetre- this is the one we'll use. For Venetian blinds and Roman Blinds, Deduct 10mm to get the blind measurement. Make no deductions for Roller blinds. Measure the width of the recess from wall to wall in 3 places as shown. Note down the shortest measurement exactly to the millimetre. For Venetian and Roman Blinds, Deduct 10mm to get the blind measurements. For Roller Blinds deduct 3mm to get the blind measurements. Specify the side you want the cord controls. Example: When measuring the drop of the reveal fit blind, and for example you get the following measures 1) as 1020mm, 2) as 1025mm and 3) as 1022mm. Write down the smallest measurement which is 1) 1020mm. This is the Exact Tight measurement. 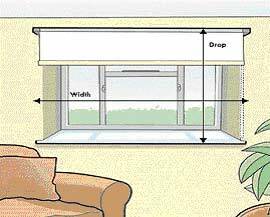 Measure the exact drop from the top of the window to where you want the blind's bottom most point to stop. To this measurement, add approximately 70mm so the blind can sit just above the window sill. Each window is different and our recommendation to add 70mm may not be right for every situation. Observe the window and imagine the blind fitting 70mm above the window and make sure it can fit. Measure the exact width of the window reveal. To this width, add approximately 100mm. This will allow a 50mm overlap on each side of the window. Note that each window is different and that our recommendation to add 100mm may not be right for every situation. Observe the window and imagine the blind fitting 50mm to each side of the window and make sure it can fit. Hint 1: Make sure your width is measured before the drop (height) and is clearly marked which is which - you'll need this later. Hint 2: Make sure you check for obstacles around and near the window that may get in the way of the venetian blind. E.g. open doors that are close to the window and observe if the face fit venetian blind could get in the way of opening doors. Example: When measuring the height of the face fit blind, and for example you get 1000mm, write down 1000mm as the exact window height. To this height add 70mm to get the Blind Height. The blind height will be 1070mm (1000mm + 70mm) When measuring the drop of the reveal fit blind, and for example you get the following measures 1) as 1020mm, 2) as 1025mm and 3) as 1022mm. Write down the smallest measurement which is 1) 1020mm. This is the Exact Tight measurement. The venetian blind become part of the window; more contemporary and I think better looking. The blinds do not project out from the wall, when blinds project they can become obstacles themselves. A 5mm gap around the window reveal will create a light gap at the edge and greater privacy. Where a window is out of square, a reveals fit Venetial blinds will make the window look even more out of square because you will have a visual point of reference. Measurements need to be much more precise with a reveal fit venetian blind. If you get it wrong, there isn&apos;t much you can do with an oversized reveal fit blind. Reveal fit blinds must consider all the elements on and around the window such as handles mailing etc. The venetian blind can fully cover the window creating less light gap and greater privacy. Less chance of making an error. Blinds project out from the wall and can become an unforeseen obstacle. Creates a new design element to the window space and introduces new lines and focal points. Measure the drop (height) by taking the measurement from the top of the recess to the window sill in 3 places as shown. Note down the shortest measurement - this is the one we'll use. Then take of 10mm deduction to allow the bottom slat to tilt. Measure the width of the recess from wall to wall in 3 places as shown. Note down the shortest measurement. Then take off 10mm for tolerance. Hint 2: Make sure you check for handles and other obstacles in the window that may get in the way of the venetian blind. Hint 3: It is best to keep cord controls away from an opening window. E.g. if the window opens on the left hand side, specify the controls to be on the right hand side. Example: When measuring the drop of the reveal fit venetian blind, and for example you get the following measures 1) as 1020mm, 2) as 1025mm and 3) as 1022mm. Write down the smallest measurement which is 1) 1020mm. This is the Exact measurement. From the exact measurement you deduct 10mm to get the venetian blind height measurement. In your venetian blind order, specify the Height (drop) as 1010mm. (1020mm - 10mm). We deduct 10mm from the exact height of the window reveal to allow the bottom venetian to tilt. If 10mm wasn't deducted, the blind would touch the window sill and when the venetian is tilted the bottom slat would not move very easily and also the blind would compress giving it an appearence that it is distorted. Measure the exact drop from the top of the window to where you want the blind's bottom most point to stop. To this measurement, add approximately 70mm so the blind can sit just above the window sill. Each window is different and that our recommendation to add 70mm may not be right for every situation. Observe the window and imagine the blind fitting 70mm above the window and make sure it can fit. Hint 1: Make sure your width is measured before the drop (height) and is clearly marked which is which - you&apos;ll need this later. Example: When measuring the height of the face fit venetian blind, and for example you get 1000mm, write down 1000mm as the exact window height. To this height add 70mm to get the Blind Height. Each blind fitting will be different. WHY ADD 70mm to the height of face fit venetian? We recommend that 70mm is adds to the face fit venetian blind to allow the blind to be fitted above the window. 70mm is the approximate size of the venetian headbox. WHY ADD 100mm to the width of face fit venetian? We recommend that 100mm is adds to the face fit venetian blind to allow the blind to overlap the window. If the blind width is the same size as the window it can move in and out of the window reveal with any wind draughts somtimes getting stuck. By overlapping, this doesn&apos;t happen. It also reduces the light gap. Decide if the roller blind will fit on or in the window. IE Reveal Fit (in) or Face Fit (on). Here are some handy hints from Fiona about the advantages and disadvantages of different filtering options for roller blinds. Advantage and Disadvantages of Reveal Fit Roller Blinds. The roller blind becomes part of the window; more contemporary and i think better looking. Light gap is less for reveal fit provided the fabric remains inside the revealing. Whether a blind fabric sits inside the reveal can be impacted by the way a blind is rolled. A back rolled roller blind will ensure that the fabric is closer to the window which will lessen the gaps. If the roller blind is front rolled the fabric could project outside the reveal and create a larger light gap. With a roller blind there will be approximately 20mm gap on each side of the fabric, creating a light gap at the edge. Where a window is out of square, a reveal fit roller blind will make the window look even more out of square because you will have a visual point of reference. Measurements need to be much more precise with a reveal fit roller blind. If you get it wrong, there isn't much you can do with an oversized reveal fit blind. Reveal fit blinds must consider all the element on and around the window such as handles mailing etc. Advantage and Disadvantages of Face Fit Roller Blinds. The roller blind can fully cover the window. Where the window isn&apos;t square a face fit roller blind can disguise the issue rather than highlight the issue. If a roller blind is both face fit and front rolled, the fabric can end up being almost 60mm out from the wall. Measure the drop (height) by taking the measurement from the top of the recess to the window sill in 3 places as shown. Note down the shortest measurement. 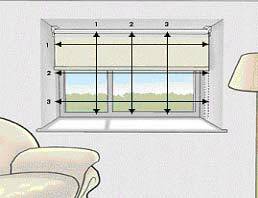 Measure the width of the recess at the top of the window where the blind will be fixed. I MEASURE AT HORIZONTAL POSITION 1. Then take off 3mm for tolerance. Specify the side you want the chain controls. Specify if the blind will roll back toward to the window (Normal Roll) or if the blind will roll over the front (Reverse Roll). Hint 2: Make sure you check for handles and other obstacles in the window that may get in the way of the Roller blind. It may be better to specify the blind to front roll so the fabric is further away from the window and clear obstacles such as handles. Back rolled blinds will keep fabric closer to the window. Hint 3: It is best to keep chain controls away from an opening window. Eg if the window opens on the left hand side, specify the controls to be on the right hand side. Hint 4: Front rolled blinds will look better, however the chains will sit behind the fabric. This may mean you damage the fabric more easily because you are always having to put hands behind the fabric. Example: When measuring the width of the reveal fit roller blind, and for example you get 1020mm. Write down 1020mm as the exact size or tight size. From the tight size measurement you deduct 3mm to get the Roller blind width measurement. In your roller blind order, specify the Width as 1017mm. (1020mm - 3mm). We deduct 3mm from the exact width simply for tolerance. It means there is room for error. Deduct 5mm if you&apos;re not sure; remember, the more you deduct, the bigger the light gap will be on the side! Measure the exact drop from the top of the window to where you want the blind&apos;s bottom most point to stop. To this measurement, add approximately 70mm so the blind can sit just above the window sill. Each window is different and that our recommendation to add 70mm may not be right for every situation. Observe the window and imagine the blind fitting 70mm above the window and make sure it can fit. Measure the exact width of the window reveal. To this width, add approximately 140mm. This will allow a 50mm fabric overlap on each side of the window. Note that each window is different and that our recommendation to add 140mm may not be right for every situation. Observe the window and imagine the blind fitting 50mm to each side of the window and make sure it can fit. Hint 4: hen face fit is specified, look to specify the roll direction as back roll or normal roll. This way the fabric is closer to the wall. Example: When measuring the height of the face fit roller blind, and for example you get 1000mm, write down 1000mm as the exact window height. To this height add 70mm to get the Blind Height. Each blind fitting will be different, so ensure that you check this works for your application. .
From the exact measurement you get the roller blind height measurement. In your roller blind order, specify the Height (drop) as 1070mm. WHY ADD 70mm to the height of face fit roller? We recommend that 70mm is added to the face fit roller blind to allow the blind to be fitted above the window. 70mm is the approximate size of the roller blind. WHY ADD 140mm to the width of face fit roller blind? French Doors, Arched Windows, Etc. The wider and taller you specify your product, the better your privacy, insulation, and light control. You also need room 60mm x 20mm vary per blind for the mounting brackets at the top, and the optional hold-down brackets at the bottom. Consider mounting the window treatment a bit higher than you'd think so when the blind is raised it blocks less of your view. Add at least 100mm at the top. For the width, add at least 20 to 30mm on both sides of the glass. Usually the deadbolt latch, however, will constrain the width you'd prefer. The product will usually fall just inside the deadbolt. In the case of a lever handle, the product will slip between the handle and the door. ll products will work on either a wood or metal door. For metal doors, you'll probably need "metal screws" designed for attaching to metal doors, which are normally hollow. Sometimes tile or trim wrap around into the window, usually several inches up from the bottom. This is common near kitchen sinks (back-splashes) and bathtubs. Most products can be cut by the manufacturers on the products' sides to accommodate this. There is a slight surcharge depending on the product and whether the cutout is on one or both sides. Measure so that your product hangs in front of the crank. Consider adding an inch or so to mitigate the slight bulge the product will make as it hangs in front of the crank. Also, the crank can usually be removed or re-positioned to point upwards, which minimizes its projection and obstruction. You may also be able to find a crank replacement device that looks like a wing-nut, and has a tiny projection. All our blinds can be specified to mount either within the door frame or over it on the wall. When determining this, consider whether the handle is an obstruction, and the amount of depth available. There is sometimes molding or trim near the baseboard which may have to be removed, or at least taken into consideration when determining width. For an outside mount it is normally sufficient to measure about 80mm wider on both sides. The wider you specify, the better your privacy, insulation, and light control. For the height, specify about 100mm above the top of the frame. 30mm minimum sill depth is required to fasten all brackets and the minimum depth necessary for a flush mount (where the product does not protrude into the room. It has been our experience, however, that 60mm is necessary to secure anchor brackets for Timber Venetians and creation woods; you'll need to angle the screw back towards the glass and occasionally add one extra bracket. Blinds Wholesale will not be responsible for products which are not within the manufacturers' specifications. Give us a call, or email for further explanation.